Ronnie Rose is trying to cope with the loss of her father; now it looks like she might lose everything else that's dear to her too. Huge debts threaten to destroy her family, her childhood home and her future. Only one person cuts through her pain. Kalen Smith has just moved to town. He's trouble and everyone knows it. He and his mysterious friends keep to themselves and the town likes it that way. But when Kalen mourns at her dad's funeral, Ronnie wants to know why and her investigation plunges her into a dangerous world of murky government secrets, with deadly consequences. Ronnie knows she should walk away from Kalen before it's too late. Problem is, she's falling for him... Can we choose who we fall in love with? First Light is a novel that keeps you reading into the wee hours of the morning. 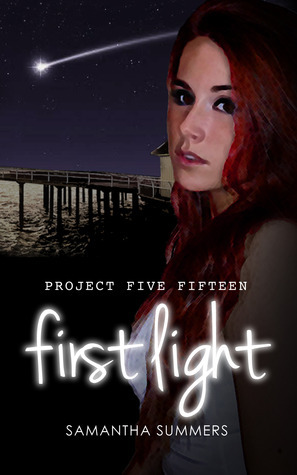 Samantha Summers hooks readers with an interesting tale and beginning to the Project Five Fifteen Series. Ronnie Rose is a formidable heroine with a stubborn streak and hopeful heart. She's the kind of girl to take responsibility after the death of her father; doing everything in her power to keep her childhood home safe and her older, more impulsive sister happy. For being the kind of girl that makes sure everyone else is content before herself, Ronnie still manages to stand up for herself and fight for what she believes in. There's a beautiful romance in First Light that Summers highlights among mystery and danger. When at her most vulnerable, the mysterious Kalen steps in and keeps Ronnie from despair. I thought the fact that she was suspicious of Kalen was slightly unwarranted. The way she accused Kalen of knowing her father seemed like she blindly pulled it out of a hat. Once she had the answers to why Kalen mourned at her father's funeral, she moved past it and the story continued more seamlessly. Kalen divulges most of his secrets to Ronnie and they're not pretty either. Thankfully, his past and life on the run hasn't completely stripped him of the ability to love and care for someone else. Though Kalen doesn't always know how to communicate or feel emotions normally, he is perfect for Ronnie. I didn't particularly care for the flashbacks that showed glimpses of Kalen and his friends on the run. Not all of them related something that held importance to the present story, but most of the flashbacks gave a helpful background story. Summers concludes First Light with an explosion of action, strategy, and tears. Ronnie makes a choice that will hopefully be expanded on in the next book of the series, As You Were. First Light is a wonderful introduction to Project Five Fifteen and Summers manages to keep the mystery alive through to the end of the story!